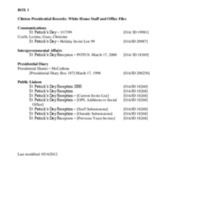 This collection consists of records relating to the St. Patrick’s Day receptions hosted by President Clinton for the years 1998, 1999, and 2000. The records contain the names of people who were invited and/or attended the St. Patrick’s Day White House receptions. The records consist of correspondence, memoranda, call logs, schedules, remarks by the President, and lists of people who were invited and/or attended the St. Patrick’s Day receptions.